Geek Girls Thank You for 100k likes!!! Geek Girl Wandering Dana - GG Profile - Facebook "Geek Girls has been an amazing journey for me. It's hard to believe we have grown to over 100,00 fans on facebook and I am so grateful for the support, it's helped my photography grow over the years! When we (myself and my geekalicious programmer boyfriend 'Teh Coderer' Jody) started the site we were new at cosplay and had no idea how awesome the community really is and we've been welcomed with open arms. Despite all the interwebz drama (haters gonna hate) our team at Geek Girls tries to rise above it and we always come together in support of our fellow geeks. We are so lucky to have such a talented, passionate, beautiful, geeky group of friends both IRL and online! The best surprise since we started Geek x Girls in 2011 is how many genuine, diverse and well rounded geeks are out there that have the courage to share their passions with the world. To me GG is a safe place for these amazing creative people who work so hard on their art to share it with a mass audience, all 100,00 of you, we <3 you! Thanks you guys and thanks to all the contributors, we wouldn't be here without all of you. Geeks Unite!! 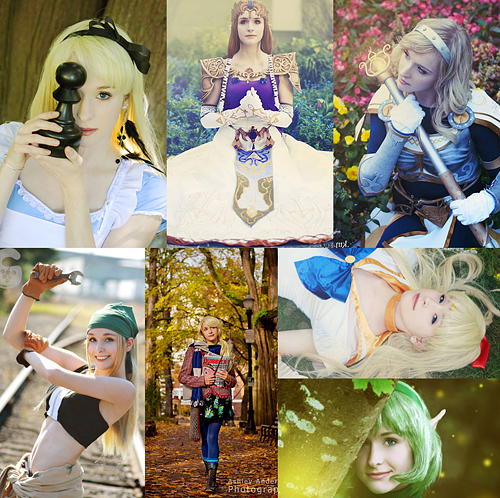 :D"
Geek Girl Zelda - GG Profile - Facebook "I have had the opportunity to work with GeekxGirls for over a year now. It's been an incredible experience, both as a contributor and as a fan. I love the work that each and every one of the girls brings to the group and to the site, they are all very talented, beautiful, funny, sweet and smart. It's an awesomely supportive group of girls as well as fans, and I am glad to be a part of something that has been such a consistently positive place for people in the geek community to come and share their passions. I look forward to working with the girls for a lot longer, as they are now some of my very great friends! There are so many things I would have not been able to do without them and without the fans. Love you all! - Zelda"
Geek Girl Roxy Lee GG - GG Profile - Facebook "Oh wow, 100k. I do not even know where to begin but let me speak directly from the heart. Geek Girls to me is more than a website and a page. It is a family and a home. It is where I feel comfort, safety, love, freedom, vulnerability, friendship and most of all creativity. It is a place where I have felt the most accepted and respected. It is a place to be who I am and embrace what I love without criticism and complaint. It is where I have made and met the most cherished of friendships. It is where I have created some of my most memorable art and shared it with the world. Geek Girls is where my heart lies. 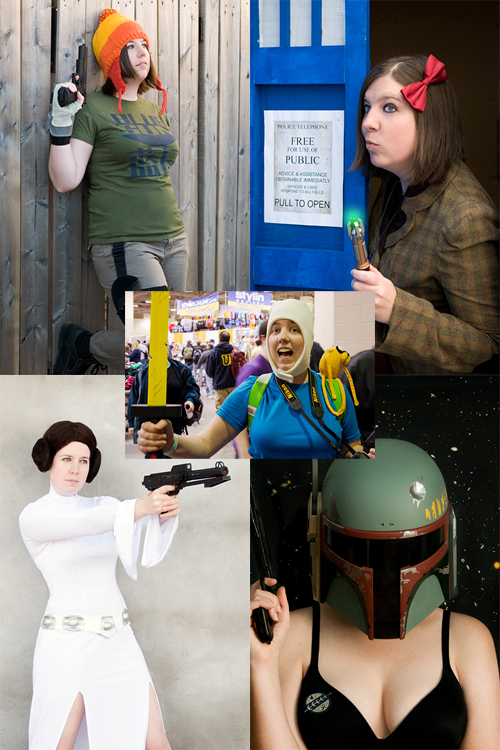 I was brought on as an official Geek Girl over a year ago when it was a relatively small page and have been honoured to watch it grow into the page and site it is now. GG has come so far from a simple geek culture FB page to a geek culture community. And that in itself is amazing to see, I am so proud of what we have become and how we have always remained true to ourselves and the original motto and goal set out for us. We have never strayed from that to become more popular in terms of likes or shares, we have always remained on track with giving respect to cosplayers/photographers and fans of all kinds. I can honestly say I love how GG has always stayed a very loving environment for everyone, regardless of some of the flack we deal with now and then. The respect we receive back makes every negative comment seem like nothing in retrospect. To be honest, I was in a very dark place before I was brought onto GG. I was going through a rough time personally and felt very unaccepted within the social circles I was in as a geek and cosplayer. But after a few weeks on the page I found myself becoming happier, more confident and started to embrace who I was and find comfort in the fact so many others were just like me. These girls honestly saved my life, they saved my joy and they made me see it was ok to just be me. I am forever thankful to the team and the page for that. Most of all thank you to Dana and Jody for creating such a magical realm for us to be a part of. You will never fully comprehend how you have forever changed my life by coming into it. I am and forever will be a Geek Girl for life. And to our fans and friends, thank you as well for making us a part of your world. We are so honoured to be able to post for all of you every day, we respect you all and appreciate you all to the ends of the earth and would not be able to do what we do without you. Thank you for getting us to 100k, it is an insane milestone for us coming from the ground up and we promise to always remain true and faithful and ourselves. Much love and stay geeky, - Roxy Lee GG <3"
Geek Girl Leen Isabel - GG Profile - Facebook "We've come a long way my geekalicious friends! It's been a joy to represent Geek Girls and find fun and awesome content to share with all of you. Let's continue to keep it fun and positive for years to come. Live Long and Prosper. <3"
Geek Girl Chrisscreama - GG Profile - Facebook "I cannot believe we hit the 100k mark already on our fanpage! It seems like just yesterday we were super giddy about 50k. We have come so far as a group. Our girls are so supportive. We stand up for our beliefs and passions, it is a beautiful thing. The creativity poured into our site by not only our girls but our fans and contributors is phenomenal. Not only am I proud to be a GeekXGirl, I am proud to be a geek. I love the feeling of being in such an amazing and loving community. The feeling of belonging. I feel working for Geek Girls over the last couple of years has helped me come out of my shell. I feel more motivated and inspired to follow through with my ideas and that I can do anything I set my mind to do! I feel like we are superheroes in our own way, presenting the internet with more girl power! Go team go!" Geek Girl Elle - GG Profile - Facebook "I have only been a Geek Girl for under a year and I was so grateful to be accepted into such a wonderful group. I would have never imagined when I started cosplay over two years ago that I would end up involved with such an amazing group of people. I have always been a nerd, being raised with two brothers obsessed with gaming and super heroes my barbies were slowly replaced with action figures and so on. To find and be welcomed into a community where being yourself was embraced was something I never thought I would find. Sharing talents, secrets of the trade and helping each other grow as cosplayers is a part of this lifestyle and community I adore. I am honored to get to work with such amazing photographers and meet some of the coolest people, all because of the networking and exposure from the wonderful people who put together such an interesting site. I am so grateful to everyone who likes the pages, follows the posts and enjoys what we as Geek Girls love doing, being ourselves and loving every second of our fandoms, crazes, costumes and more. Nothing is more enjoyable than showing off your hard work and having people respond in such a fabulous way. Thank you to everyone who is support of the hard work that everyone puts forth to bring you fans content. Much Love Elle." 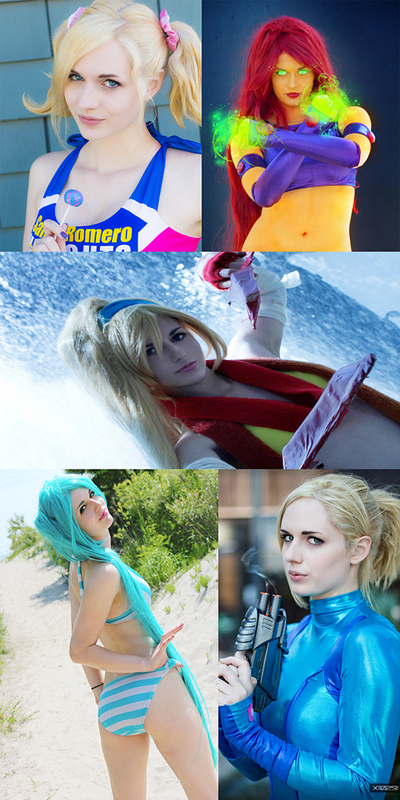 Geek Girl Evie Evangelion - GG Profile - Facebook "I was so lucky to learn about the GeekXGirls group right when I started cosplaying, seeing a group like this really made me want to get into cosplaying more, all the great cosplays on the site game me something to look up to. When I was able to become part of GeekxGirl�s I was so happy and I felt so honoured. 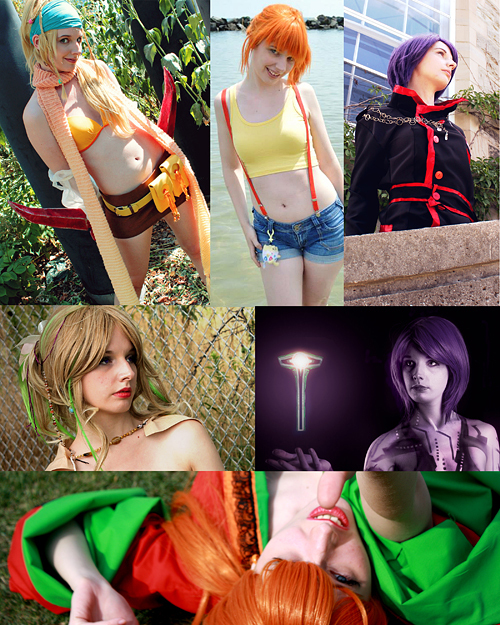 I has been great to be able to talk with the girls that�s costumes I looked up to and to make more friends within the cosplay community. -Evie"
Geek Girl Lossien - GG Profile - Facebook "When I first heard about GeekxGirls, I wanted to be a part of it so bad! �I was fortunate enough to collaborate with Dana on my Mystique shoot, and apparently impressed her enough to be offered a position. That was back in 2011, when there were only a hand full of girls. �We've grown so much since then, both in geeks and followers, and I am honoured to be a part of this group. �The girls are funny, intelligent, and geeky enough to make me feel like I've found the mothership - the place where I can be myself and not have to worry about what people will think. Geek Girl Dezi - GG Profile - Facebook "I hardly can remember the day where I was messaged being told I should join up with Geek Girls, I'm so glad I did. From feeling like a mediocre cosplayer to getting such wonderful feedback right from the start and growing with you all as a wonderful encouraging audience has been a big part of what brought me to where I am now. Getting to share with you my passions through cosplay, photography, and eventually even my journey into performing and producing nerdlesque. From getting to travel out to the home base of operations in Ontario and model for the site with Dana, making other passionate talented friends and pushing myself to grow as an artist; it has all been an amazing adventure and a big part of my life that I'm excited to see going so well and received with so much love as it expands. Geek Girls is full of so many like myself that I've gotten the pleasure to know and be connected with in this community, you all inspire me so much. Your feedback and support is much appreciated!" 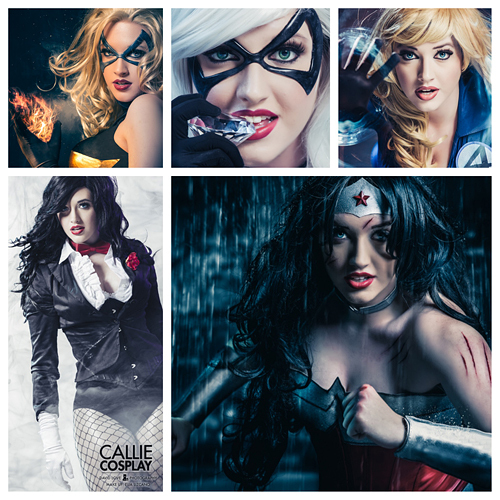 Geek Girl Callie - GG Profile - Facebook "It seems just a little over a year ago that I was a fresh and eager face in the Cosplay community. I'd had my very first shoot with David Thorpe as Black Widow and upon further researching black cat costumes, I began to stumble upon what is now the phenomenon of the interwebs...Cosplay. I remember David sending me a hyperlink to this page called Geek Girls, and I will never forget the showering amount of happiness and flooded inspiration I instantaneously was consumed with upon clicking the link. It was Cosplay I had never seen before...amazing articles of all things geek and tons of archived galleries of endlessly gorgeous and profound Cosplay shoots I ogled at for days and days, weeks, and months later (still even to this day). I could only dream that I would submit my first set and they would except it! I remember my admiration towards the posts, captions, and comments from the apparent geek girl members...and I remember how loving and supportive each and every one was. I never thought I'd actually become one....we were under 30,000 'Likes' back then. 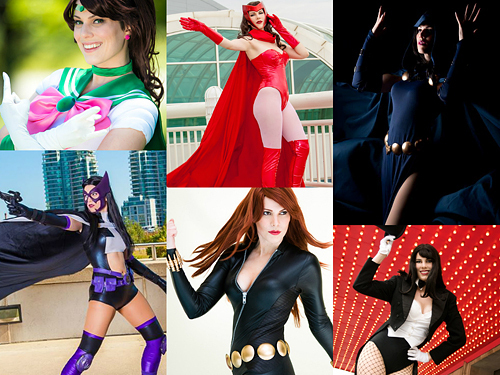 Today, I'd say I've come a long way in the Cosplay - geek - community with great thanks to a loving and supporting husband, family, fan base, wonderful photographers, amazing artists, and my rock...My Geek Girls. I would not be anything without them, and I owe it all to them. I could go on about how I can talk to fellow members about anything, and how these girls are like my freakin' soul sisters seemingly worlds away. I love you all so much, the girls I get the pleasure of talking to often and the girls who I see through their individual pages and geek girl submissions. Thank you Geek Girls, for everything, I'm am still truly amazed and honored to be a member of such a profound group of gals (and guy) in the geek community. Congratulations on 100,000 'Likes.' And lastly, thank you to all of YOU, our dear fans - FRIENDS - for making all of this possible." Geek Girl Gillykins - GG Profile - Facebook "My journey with Geek Girls started back in 2011, during the sites infancy, when Dana and Jody asked me to submit my Diablo Sorceress set. After being a part of different shoots and online content Geek Girls and I finally make our relationship official at the beginning of 2013. I couldn't ask to be part of a better site or community of women (+Jody). I love how every girl one of the Geek Girls is quirky and nerdy in their own ways, we have such a diverse group of well spoken women that can represent almost every section of geekery. Thank you to everyone who submits our awesome content and everyone who checks out what we have to offer. I can't express how excited I am that 100,000 people follow us on our fabulous geeky adventures!" Geek Girl Amaleigh - GG Profile - Facebook "Being around when GeekXGirls was first created, I've had the chance to see how much it's grown. From a small site with a small handful of girls to the amazingness that it is today, it's absolutely incredible! Being a geek girl with my fellow geeks it's a wonderful experience and it's just like a family. I know I can count on these girls if I ever need anything. 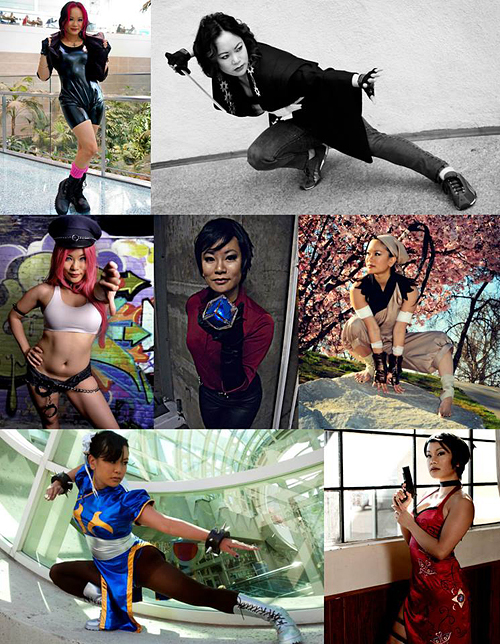 GeekXGirls has taken me on an incredibly geeky journey and the fans and support is so amazing! I love seeing what my fellow geeks come up with, all the crazy content and even being recognized at conventions! It just blows my mind! So I just want to thank Dana and Jody for allowing me to be a part of this whole thing! And thank you to my fellow geek girls and fans for being so supportive!" Geek Girl Lovina - GG Profile - Facebook "I've watched Geek Girls grow from a few thousand followers to now over 100k in just a few years (HUZZAH!). I am so grateful to be apart of this site. Not only has it opened more creative doors for me as an artist, because of Geek Girls, I was introduced to an amazing group of people i would have never met, both locally and around the world. Geek Girls has made attending comic book conventions more then just to check off items from my wish list, its now a homebase to get together and hangout with my friends. Friends that I'm only able to see at these event because of our distance. I'm looking forward to many more adventures with you ladies and gent! and of course our AWESOME followers! xoxo -Lov"
Geek Girl Player Two - GG Profile - Facebook "How amazeballs is it that we have hit 100,000 likes?!? WOO! This year I have spent with Geek Girls has been the best year of my life.. Hands down. When I had first joined, I was just so excited to find other people that were into the same stuff that I was, and now, I have made friendships that will last a life time. Thank you all for your growing support!! To think, this had started out as two amazing peoples dream and now Geek Girls is slowly taking over the world *strokes hairless cat and spins in chair* MUAHAHAHAHA..."
Geek Girl Soulwynn - GG Profile - Facebook �What a journey this has been! And it�s not even over yet! I have had a great time with the GeekxGirls. There is nothing better than getting to share one�s interests with others. 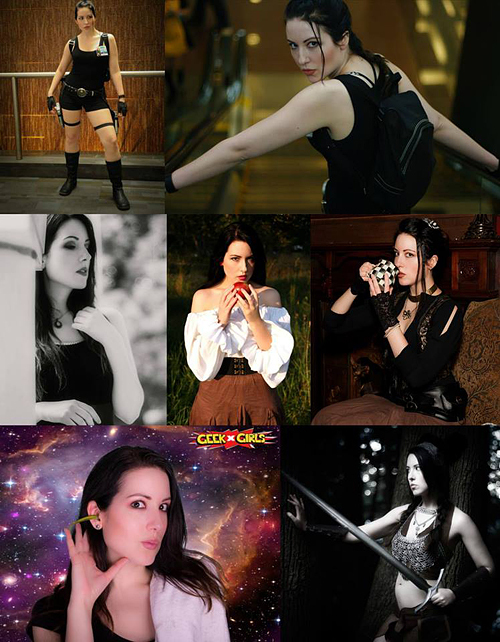 Cosplay was a wonderful way for me to do a combination of things I love: dress-up, acting, modeling, and showing off whatever game or movie my character�s based on! I always look forward to future conventions with these wonderful women. They make everything so much fun and we�re very supportive of each other. I sincerely cherish this group because I have searched for a place to belong my whole life, and they make me feel like being weird and loving what I love is totally okay! Which is exactly how I should feel! This page reaching 100, 000 likes just means we�re doing something right. We do our best to give you guys content that you can appreciate. And although sometimes we might not please everyone, our constantly increasing numbers speaks for itself. It means we are reaching people who have awesome interests. We would not be here without our fanbase and we can�t thank you enough for your constant support. We appreciate your positivity and your encouragement. My closing thoughts on Geek Girls and the followers/friends/fans who got us to where we are now? "This is true love... you think this happens everyday?" Geek Girl Th3 Rogue - GG Profile - Facebook "Hello Fellow Geeks!! Just wanted to quickly say thank you to all those who have been so supportive all the Geek Girls and myself from the get go, and thank you for getting us thus far! All of your kind words of encouragement do not go unnoticed, and are very, deeply, appreciated!! And now that school is back in session, I can finally host Gaming Night with Th3 Rogue again!! Every weekend I will be taking your requests on what you would like to play on the Xbox360, and help you school some noobs, and vice versa!! Thank you again to all the friends and fans of Geek Girls, it's been wonderful getting to know you all and I look forward to gaming with you in the future! Ooh- Rah! -Monica aka Th3 Rogue Th3Rogue.com"
Geek Girl Natalie GxG - GG Profile - Facebook "I first met the Geek Girls a few months after being created. They had their first booth at a small event . The girls were so inviting, friendly and the cosplays were fantastic. That night I went home and bookmarked the website and I have been watching this amazing site grow ever since. I remember being super excited when I was offered to join. Nervous because I was still fairly new to cosplay, only being a part of the community for a few years. But everyone had been so great my nervousness went away really fast. Over only a few years we have become an amazing community of 100,000 people+. I love being a Geek Girl. I love the people involved, the supporters, the submitters, the girls, and everyone else in between. The amount of support I have seen on all levels had been inspiring. Getting to see how many people that are as passionate about their fandoms as we are about ours, has made me and I'm sure many others out there feel more accepted. I am so thankful to be a part of Geek Girls and am excited to keep watching our community grow." 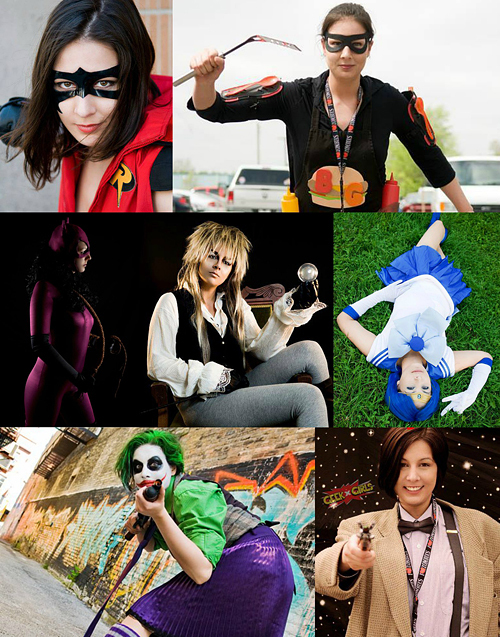 Geek Girl RikkuGrape - GG Profile - Facebook "Seeing the GeekxGirls grow has been an absolute delight! I'm still new to the family, but I've known of this lovely group of talented artists for quite a while and seeing their work, passions, and love for all things geek blossom has been truly wonderful! The ladies and gents here are a constant inspiration to me and to see the overwhelming amount if support and love given to each of us is so very humbling. Being a part of this family has been such a joy as well! I've never felt more supported and comfortable with a group of people online. I can't emphasize enough just how fantastic every member is and how much the 100,000 of you who support us all is! It's more than words can say, but please, know just how much it means! 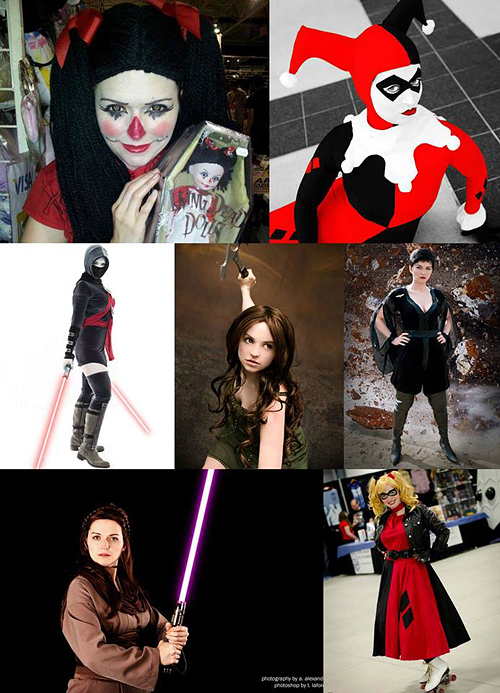 Being a part of GeekxGirls has taught me many things, and I am so happy to be here! It's a heart-warming experience to see so many people's love and support in one place. 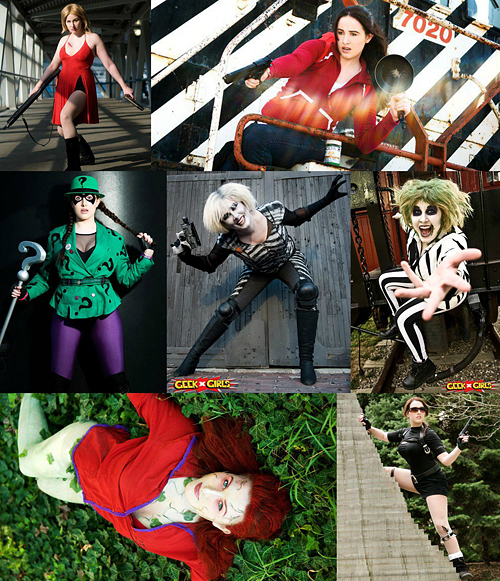 I can't wait to grow more as a cosplayer, geek, and person with the GeekxGirls! It's an adventure I've never been more excited for <3 -GG RikkuGrape"
Geek Girl Northern Belle - GG Profile - Facebook "As one of the newer Geek Girls I don't have the wealth of experience that some ladies do here, but in my short time I've gotten the chance to see an incredible network that spans hundreds of miles - literally. It is amazing to have a place where we can turn to people of a similar mind set for advice be it costuming or community concerns. Furthermore despite the fact that we all have similar interests we all come from vastly different places and so it is an amazing opportunity to try and grow our work both as individuals and within a collaborative!" Geek Girl Critical Miss - GG Profile - Facebook "I am still relatively new to Geek Girls and loving every minute of it. I feel very privileged to be among such a talented, exceptional and beautiful group of geeky girls. Girls who know how to have fun and and poke fun at themselves. Women who are knowledgable and aren't afraid to show the world who they are and what they love. Here's to 100k and beyond!" 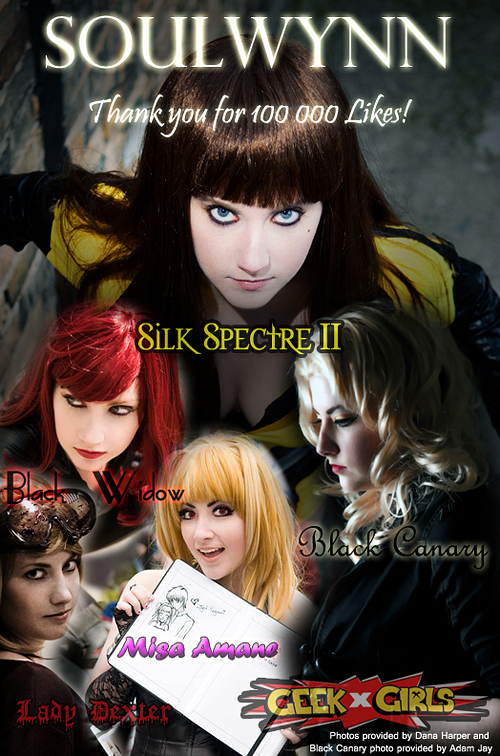 Geek Girl Lily Spitfyre - GG Profile - Facebook "We now officially have enough likes to populate the entire little town I live in! Wow! Could you imagine a town entirely of geeks? I think it'd be a FANTASTIC place to live. GeekxGirls is built on a premise of fun, comraderie, and celebrating our passions and obsessions together. I'm NEVER afraid to post anything to this page, or to the website... why? Because for every hater, there's a thousand awesome fans who shall strike them down with the mighty power of THO- I mean... acceptance. Why am I a Geek Girl? Because I love all the other girls on this site like sisters. They're the ones I come to for help, the ones I'm proud of when they win awards or complete personal challenges, the ones I look up to! I love seeing what my friends, their friends, and their friends-of-friends can do! This community is hands-down the most creative, resourceful and FUN community I've ever been a part of. I'm proud to let my freak flag fly, and am so glad I can continue to be a part of such a rockin' site. Much geek love, xo Lily"
Geek Girl Teryl Dactyl - GG Profile - Facebook "It all started when my best geek girl Chrisscreama told me all about the website and asked me to help represent the Geeks at Fan Expo Vancouver. I had seen various friends posting about the page and the wicked cosplays on the site for a while, but I didn't know too much about the girls behind it and what it all meant. Well, when Chrisscreama informed me about all the girls and what the site was all about I was on board. How could I not want to be part of an awesome group of girls who get to showcase their talents and geekery with others who can appreciate it like we do?! I've been pretty obsessed with Halloween and being able to dress up since I was a child... which eventually turned into an obsession with costume design and makeup. Now I'm just thrilled that I can share my creations with the world and hopefully inspire others to get their geek on as well. Thanks for being a fan! <3 - Teryl Dactyl"
Geek Girl Malb0t - GG Profile "I remember the day Dana and Jody first mentioned Geek Girls to me, just a cool idea they'd come up with that allowed them to collaborate with eachother and the community. With Dana as a gifted photographer and Jody a talented web builder they were well-equipped to bring this now thriving community to fruition. I've watched it grow and develop into the huge site it is today, and I want to thank these two for allowing me to be a part of it! Cheers to many more fans and great content in the future. -GeekxGirl Malb0t"